Original Scores, Acoustic Piano - relaxing and transformative piano music inspired by natural beauty evokes feelings of reflection and inner peace. 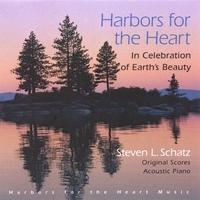 "Harbors for the Heart: In Celebration of Earth’s Beauty"
"Harbors for the Heart: In Celebration of Earth's Beauty" is relaxing and transformative piano music inspired by natural beauty which evokes feelings of joy, contemplation and inner peace. Bio: Steven L. Schatz, MA is the founding director of Center for Music & Imagery, a training center for professionals interested in working with the healing forces of music and spiritual psychology. He is the author of "There Lives Love," a booklet describing his work, and the forthcoming, "Music & Imagery: A Bridge To The Soul." Steven lives with his family in Lexington, Massachusetts.